03-11-19 - Home page updated. 01-10-19 - Dates page Updated. 01-03-19 - Working on the dates page. Keep checking as the 2019 dates get added. 02-12-18 - dates page updated. 01-02-18 - 2018 calendar updated. 04-19-17 - dates page updated. 04-11-17 - dates page updated. 02-08-17 - dates page updated. 02-06-17 - dates page updated. 01-18-17 - dates page updated. 11-30-16 - dates, index, and songlist pages updated. 09-19-16 - dates page updated. 07-16-16 - dates page updated. 03-22-16 - dates page and songlist page updated. 02-22-16 - dates page updated. 12-15-15 - link to 2016 dates added to bottom of the dates page. 10-22-15 - dates page updated. 08-30-15 - dates and songlist updated. 04-30-15 - dates page and songlist page updated. 03-19-15 - dates updated. Songlist page updated. 01-21-15 - dates page updated. Keep checking working on this page all week. 01-12-15 - dates page updated. 10-06-14 - dates page updated. 07-17-14 - dates page updates. 07-09-14 - dates page updated. 05-20-14 - dates page updated. 05-11-14 - dates page updated. 05-06-14 - dates page updated. 05-04-14 - dates page updated. 04-25-14 - dates page updated. 04-24-14 - dates page updated. 04-22-14 - dates page updated. 04-14-14 - dates page updated. 04-01-14 - dates page and songlist page updates. 03-19-14 - dates page updated. 03-08-14 - Dates page updated. March 8th changed to the Swamp in Florence. 02-26-14 - Link to Black Glass App added to home page. 02-25-14 - photo and dates pages updated. 02-18-14 - dates page updated. 02-05-14 - dates page updated. 01-30-14 - dates page updated. 01-21-14 - dates page updated. 12-23-13 - 2014 dates Updated. 12-11-13 - Songlist page updated. Link added to the dates page for 2014 dates. 11-26-13 - dates page updated. 10-24-13 - dates page updated. 10-07-13 - dates page updated. 08-22-13 - dates page updated. 08-08-13 - dates page updates. 07-31-13 - photo page updated. 07-25-13 - dates page updated. 07-17-13 - dates page updated. 07-02-13 - photo's page updated. 07-01-13 - dates page updated. 06-02-13 - dates page updated. 05-21-13 - dates page updated. 05-09-13 - dates page updated. 05-01-13 - photo page updated. 04-03-13 - dates page updated. 03-13-13 - dates page updated. 02-27-13 - photo page and dates page updated. 02-19-13 - dates page updated. 02-11-13 - dates page updated. 02-04-13 - dates page updated. 01-31-13 - Dates Page updated. 01-24-13 - Dates Page updated. 01-22-13 - photo's page updated. 01-08-13 - dates page updated. 10-23-12 - dates page updated. 10-17-12 - dates page updated. Buckhead Saloon in Greensboro added. 10-13-12 - dates page, songlist page and contact page updated. 09-06-12 - dates page updated. 02-20-12 - dates page updated. 01-27-12 - dates page and songlist page updated. 01-13-12 - dates page updated. 12-29-11 - dates page updated. 11-04-11 - dates page updated. 09-21-11 - dates page updated. 08-10-11 - dates page updated. 07-19-11 - dates page updated. 06-23-11 - dates page updated. 05-10-11 - dates page updated. 05-04-11 - dates page updated. 04-27-11 - Lots of dates added to the Dates page. 04-14-11 - Songlist page and dates page updated. 04-06-11 - Dates Page updated. 03-23-11 - Dates Page Updated. 03-21-11 - Dates page updated. 02-23-11 - Dates page updated. 02-13-11 - Dates page updated. 01-31-11 - Photo's page updated. 01-27-11 - Dates page updated, look for pics on the photo's page from the gigs to start up again this year, every week starting this weekend. 01-12-11 - Dates page updated. 01-05-11 - Dates page updated. 12-23-10 - Dates Page updated. 09-22-10 - Hard Rock Cafe on New Years Eve added to dates page. 09-14-10 - dates page updated. 08-07-10 - dates updated. Onemor Restaurant Bar & Grill added August 13th. 08-03-10 - dates updated 06-30-10 - Lots of dates added and changed. 05-26-10 - Double Door added to dates on June 12th. 04-30-10 - Dates page updated. 04-27-10 - Dates page updated. 04-20-10 - Dates Page Updated. 03-03-10 - Dates Page updated. Song list page updated. 03-01-10 - Black Glass on Facebook link added to front page. 02-16-10 - Dates page updated. 02-04-10 - Photo's page updated. 01-12-10 - Dates page updated. 01-04-10 - Dates Page Updated. 10-12-09 - Photo's page updated. 07-14-09 - Dates updated. Miller's in Dillon SC added on July 25th. 06-13-09 - Dates page updated. 06-04-09 - NV, Sgt Peppers and Whiskey River pics added. 05-26-09 - Bike Week Photo's added. 05-05-09 - Over a months worth of pics added to the photo's page. 05-04-09 - Beaver Bar in Murrells Inlet(Myrtle Beach) and Broadway Way at the Beach (Myrtle Beach) dates added. 03-25-09 - NV 3-17-09 and Coyotes 3-21-09 pics added. 03-16-09 - Sidelines 3-14-09 pics added. 03-07-09 - Dates page updates. NV club added on Tuesday March 17th. 03-02-09 - Murphy's, NV Club, Sgt Peppers, and Blarney Stones pics added. 02-27-08 - Finley's 2-29-08 and the Boathouse 8-24-08 pics finally added. Will be catching up will old pics they next week or so, be sure to check back. 02-26-09 - Jezzabelle's 2-21-09 pics added and friends page updated. 02-09-09 - Dates page updated. 01-27-09 - Songlist Page updated. 10-09-08 - Dates page updated. 09-17-08 - Pics added to photo page. 09-02-08 - Murphy's 7-26-08, Plum Crazy's 5-9-08 pics added. 07-29-08 - Photo's page updated. 06-24-08 - Pic's added to photo page. 06-05-08 - Several photo albums added to photo page. 05-20-08 - New dates added. 05-08-08 - CD's are in. Get yours at all the gigs. We'll set up a place to buy the MP3's here on the website soon. 05-05-08 - pics added to photo page. 04-03-08 - Lots of Photo's added to photo page. 03-05-08 - Coyotes and Blarney Stones pics added to photo page. 02-27-08 - new dates added. 02-19-08 - New Dates added. 02-13-08 - Cripple Creek, Coyotes and Finley's pics added to photo page. 02-11-08 - Dates page updated. 02-08-08 - Dates page updated. 01-22-08 - Dates Pade updated. 01-17-08 - Dates Pages updated. Most of 2008 included. There will be more dates added. And as always, anything can change. 01-15-08 - Jezzabelle's Pics added. 01-15-08 - Gear Page Updated. 01-03-08 - New Years Eve Pics added. 12-19-07 - Finley's, Sgt Peppers, Plum Krazy's, Wild Wing and Plum Krazys II pics added. 12-07-07 - Stables pics added. 12-05-07 - Dates page updated. 12-04-07 - Gear page updated. 11-13-07 - Coyotes Pics added. 11-07-07 - Finley's Pics added. 10-31-07 - Sgt. Peppers and Plum Crazys pics added. 10-20-07 - Reviews page has been updated. 10-20-07 - Jezzabelle's Pics added. 10-16-07 - Gear page updated, DMX Intelligent lights and Bubble Machine added. 10-16-07 - Bandana's, Coyotes and Plum Crazy Too pics added. 10-02-07 - Friends page updated. 09-26-07 - Hard Rock Park and Blarney Stones pics added. 09-19-07 - Coyotes and Plum Crazys pics added. 09-13-07 - Finley's and Sgt Peppers pics added. 09-11_07 - Murphy's Pics added. 09-03-07 - Sites reaches 200,000 page hits! 08-29-07 - Bandanas Pics added. 08-29-07 - Gear page updated and new dates added to front page. 08-22-07 - Blarney Stones Pics added. 08-06-07 - Friday Coyotes pics added. 08-05-07 - Coyotes pics added. 07-31-07 - Wild Wing and Sgt Peppers photos added. 07-23-07 - Murphy's Pics added. 07-18-07 - Bnadana's Pics added. 07-11-07 - Roadhouse pics added. 07-11-07 - Mike and Steves Pics added. 06-28-07 - Plum Krazys and Bandanas Pics added. 06-27-07 - Finley's Pics added. 06-25-07 - Murphy's, Coyote's and Sgt. Peppers pics added. 06-07-07 - Bandana's pic's added. 06-06-07 - Double 18 speaker cabinet's added to P.A. 05-21-07 - Bike week Pics added.Almost 300 pics. 05-15-07 - Finley's Photo's added. 05-09-07 - Murphy's Pics added. 05-07-07 - New dates added. 05-03-07 - Sgt peppers pics added. 04-24-07 - Bandana's 4-22-07 pics added. 04-19-07 - Hard Rock Park Pics added. 04-17-07 - St. Andrews pics added. 04-09-07 - Blarney Stones Pics added. 04-03-07 - Finley's Photo's added. 04-02-07 - All dates added to front page. 03-27-07 - Rockin Roadhouse 4th of July weekend (6th and 7th) confirmed. Coyote's NEW YEARS EVE confirmed. 03-27-07 - New 32 Mixing console, 2 18' P.A. cabinet's, and 2 dual 31 band eq's added to P.A. stystem. 03-26-07 - Coyotes and Sgt Peppers pics added. 03-21-07 - Site reaches 150,000 page hits. 03-19-07 - Murphy's Pics added. 03-11-07 - Bandana's pics added, gear page updated. 03-01-07 - "Dates" page updated. 02-27-07 - Finley's and Plum Crazy's pics added. 02-20-07 - Sgt Pepper and Coyotes pics added. 02-20-07 - Video's have been updated with smaller and easier to play files. If you have the DVD you already have these versions. Ipod users can now download the video's for play on your audio or video Ipod. 02-10-07 - Stables pics added. 02-08-07 - Online Store added to site. 01-29-07 - Murphy's pics added. More Bandana's Pics added. 01-25-07 - Bandana's photo's added. 01-17-07 - Finleys and Plum Crazy's photo's added. Be sure to click on the "dates" page to see the calendar for all of 2007. 01-11-07 - Gear page and Links page updated. 01_08_07 - Site reaches 125,000 page hits! 01-08-07 - Sgt Peppers and Coyotes pics added. 01-03-07 - New Years at Greenroom Pics added. 12-18-06 - Stables Pics added to photo page. 12-15-06 - The Black Glass equipment trailer is painted with our Logo. Thanks Mike we love ya!! 12-12-06 - Link to more Plum Crazy photo's at Mark Breland's site added to photo page. 12-12-06 - Friends page updated. 12-12-06 - Bandana's photo's added. 12-06-06 - Look for Black Glass Koozy's coming in January. 12-06-06 - More 2007 dates added. Check "Dates" link for details. 12-06-06 - Finleys and Sgt Peppers from Dec 2nd and 3rd added to photo's page. 11-22-06 - Lots of dates for 2007 added to the dates page. 11-22-06 - Added link to the Black Glass store on ebay. It will have the t-shirts, shot glasses, DVD's, lighters and other items soon. 11-20-06 - Coyote's and Plum Crazy Pics added. 11-13-06 - Murphy's Photo's added. 11-08-06 - Bandana's photo's added. 11-05-06 - Dates page and Setlist page updated. 10-29-06 - Stables Halloween pics added to photo page. 10-29-06 - Songlist Page Updated. 10-25-06 - DVD's are now available at all Shows. 10-22-06 - New songs added to Songlist page. 10-22-06 - Stables pics added to photo page. 10-18-06 - Added For Whom The Bell Tolls Video to front page. 10-11-06 - Updated tk's basses and Ronnie guitars on the gear page. 10-11-06 - The lastest Murphy's, Finley's and Sgt. Pepper's pics have been updated with extra pics. 10-10-06 - The Oct Roadhouse dates in Myrtle Beach have been canceled, we will be in Dillon for 2 weeks in a row. Please everyone planning on making the trip to the Beach take notice and come on over to Dillon. 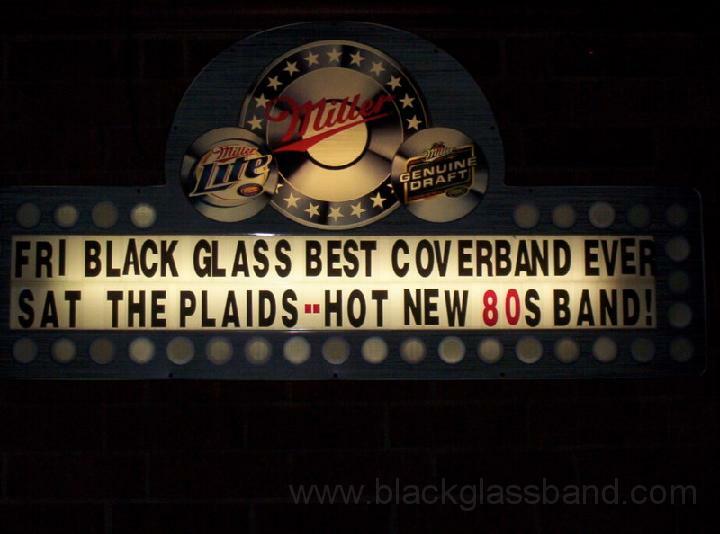 10-09-06 - blackglassband.com reaches 100,000 page hits in less than a year and a half. 10-09-06 - Murphy's, Finleys and Sgt. Peppers pics added to photo page. 09-29-06 - Added 2 new Black Glass wallpaper's for your computer to the top of the photo page. 09-21-06 - Added Full video of "Fly To The Angels" to front page. 09-19-06 - Scooters Pub pics from 8-26-06 added to photo page. Thanks Debjean for the pics. 09-19-06 - Stables 9-16-06 pics added to photo page. 09-19-06 - 44 dollars and the trailer, Lights and P.A. will be paid off, which we will do next weekend. Thanks to everyone for making this a great year!! 09-13-06 - Roadhouse pics added to photo page. 09-12-06 - Gear Page updated. 09-12-06 - 16 Par 56 light's and 3 Chauvet CH-2000S 75 W Techno Strobe Light's added to lightshow. 09-05-06 - Bandana's 9-2-06 Photo's added to photo page. 08-22-06 - Murphy's Photo's added to Photo page. 08-15-06 - Finleys and Sgt Peppers Aug 11th and 12th 06 pics added to photo page. 08-10-06 - Stables 8-5-06 pics added to photo page. 08-08-06 - The calender has been updated. The year is completely booked. Clubs and venues, we are now starting to book 2007. Contact Johnny to see what dates are available. 08-08-06 - The new Photo's albums will now have slideshow's built in. Just click an image then at the top right start the slideshow. Only the best baby!!! 07-18-06 - Murphys Pics added to photo page. 07-18-06 - Gear Page updated. 07-12-06 - Metel Rebel pics from July 7th and 8th added to photo page. 07-06-06 - Stables pics added to photo page. 07-06-06 - Midtown May 28th pics added to photo page. 07-06-06 - Sgt Peppers pics updated. 07-05-06 - blackglassband.com is exactly 1 year old. 07-01-06 - We now have Black Glass Shot Glasses, see Scotti and the shows to get yours. 06-28-06 - Roadhouse pics from Myrtle Beach added to photo page, including the Talon Reunion. 06-21-06 - Updated tk basses on gear page. 06-21-06 - Sit reaches 75,000 hits milestone!! 06-19-06 - Buford Sports Cafe and Sgt Peppers pics added to photo page. 05-31-06 - Midtown Pics added to photo page. 05-23-06 - Updated Friends photo page. Updated The Bike week Pics, added Finley, Sgt Peppers and Stable pics to photo page. 05-20-06 - Bike Week in Myrtle Beach Pics added to Photo Page. 05-08-06 - Added photo page of Black Glass friends and fans with Black Glass shirts etc...See link on home page. 05-08-06 - Metal Rebel pics from May 5th and 6th added to photo page. 05-01-06 - Added Roadhouse pics from April 28-29 to photo page. 05-01-06 - Murphys April 23-24 Photo's added to photo page. 05-01-06 - More dates added to the calendar. 04-25-06 - Updated Gear Page. 04-24-06 - Lots of new dates added. 04-20-06 - Added 4-15-06 Stables Photo's to photo page. 04-05-06 - Added Sgt Peppers 4-1-06 Pics to Photo page. 04-04-06 - Added Slideshow from Midtown March 18th 2006 to the Photo Page. 03-30-06 - Added Roadhouse pics from 3-25-06 to photo page. 03-22-06 - Added Midtown Sundries March 18th Pics to photo page. 03-22-06 - Added More Metal Rebel March 2006 Pics to Photo Page. 03-17-06 - Added Metal Rebel Pics from March 11th and 12th weekend to photo page. 03-03-06 - Added new dates. New Years Eve, Friday Night Outdoor Show Bike Week - Broadway At The Beach - Myrtle Beach, and another Rockin Roadhouse date. 03-03-06 - New Pics from Rockin Roadhouse, Murphy's and Sgt. Peppers added to photo page. 03-01-06 - Site Reaches 50,000 Hits milestone! 02-20-06 - Added Sgt Peppers pics from Feb 18th 2006 to photo page. 02-07-06 - Added Lucky 13 and Smokin to the links page. 02-07-06 - Racing Stables pics added to Photo Page. 02-07-06 - Added Calendar to front page. 02-02-06 - Stage One Bar in Charlotte added to Calender. 02-02-06 - Voodoo Highway (Ronnie's Acoustic Band) dates added to calender. 02-02-06 - More Pics from Murphy's Friday Jan 20th added to photo page. 02-02-06 - More Pictures added to photo page from Saturday Night In Myrtle Beach at the Roadhouse. 02-01-06 - Added Live chat room to website. 02-01-06 - Added Slide show to front page and gear page. 01-29-06 - Tim Clark's Rockin Roadhouse dates added to Calender in March and April. 01-29-06 - Added the first of many to come, Black Glass wallpapers to the photo page. Just right click and hit "save target as" to save on your hardrive. 01-29-06 - Saturday night Jan 28th 2006 Roadhouse pics from Myrtle Beach added to photo page. 01-28-06 - Friday night Jan 27th 2006 Roadhouse pics from Myrtle Beach added to photo page. 01-24-06 - A few pics from Murpys Jan 20th-21st-06 added to photo page. 01-24-06 - Site reaches 40,000 page hits. 01-24-06 - Updated Gear page, updated dates and added copyright notes to bottom of pages. 01-11-06 - More Midtown Jan 7th pics added to photo page. 01-09-06 - Site reaches 35,000 page hits. 01-08-06 - Midtown Jan 7th pics added to photo page. 01-03-06 - Photo's Of New Years Eve at Ken's added to Photo page. 12-19-05 - Sgt Peppers pics added to photo page. 12-16-05 - Site reaches 30,000 page hits. 12-13-05 - New photo's from Murphy's Dec 9th and 10th added to photo page. 12-08-05 - New photo's added from Metal Rebel Dec 2nd and 3rd added to photo page. 11-29-05 - New photo's from Ken's Nov 25 & 26 added to photo page. 11-17-05 - Updated the links. 11-16-05 - New full video's added to front page. New message board added. 11-15-05 - Email and phone contact page added. 11-12-05 - Slideshow updated with over 1000 pics. Dead or Alive Video added to front page. 11-06-05 - Black Glass Fan Map added. Click HERE to add yourself. 11-05-05 - All photo pages have been upgraded now and have thumb nails. Pics from Metal Rebel July 29th added. 11-01-05 - Ken's Halloween Pics added to photo page. 10-24-05 - Murphy's 21st and 22nd photo's added to photo page. 10-12-05 - Metal Rebel - Oct 1st 2005 Pics added to the photo's page. 10-11-05 - Midtown Sundries pics added to photo page. 10-10-05 - Short video's added to home page. 10-09-05 - New pics added on most all pages around the site. 9-30-05 - Roadhouse pic from 23rd and 24th added. 9-10-05 - Photo's page updated. 8-29-05 - Gear Page updated. 8-21-05 - Captain Ron and tk have completed the 4 tier lighting cages. The full 30 plus light show should be up and running this weekend at Ken's. 8-21-05 - New photo's from Ken's on Aug 19th and 20th added to photo page. 8-21-05 - Updated the Songlist. 8-21-05 - We will be back at Kens the weekend of the 26th and 27th. 8-21-05 - T-shirts and hats are in. Thanks to all who got shirts and last weekend at Ken's. If you live out of town and want a shirt or hat, email Johnny on the homepage for details about ordering them. 8-12-05 - Gear page updated. 8-12-05 - Added a Message Board to the Site. 8-09-05 - Gear Page updated. 8-08-05 - Photo's added from Metal Rebel 8-5-05 added to photo's page. 8-07-05 - New video of Home Sweet Home added to front page. 8-04-05 - Dates have been added through the end of the year. 7-26-05 - The gear page has been updated. 7-24-05 - New slideshow from Murphy's 7-22-05 is up Here. 7-23-05 - Pics of Murphy's have been added to the photo's page. 7-23-05 - Watch 2 Video's from Murphy's in Florence Saturday Night 7-22-05 Pour Some Sugar on Me - Dream On (right click and "save target as" to save to computer). 7-21-05 - Blass Glass is the proud owner of a brand new 16 foot equipment trailer. New photo's added from June 17th and 18th at Kens. Black Glass has just purchased a full 30 par can light show, look for the new production coming soon to a stage near you.